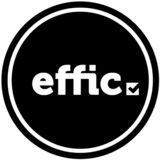 www.effic.co Avant de commencer, je vous invite à visiter le site and sign up for our free trainings which will give www.ProductivAction.com you toolsinscrire and techniques you needgratuite to achieve afinthe de vous à la microformation qui yourdonnera best results withetminimum wasted effort vous les outils les techniques dont vous or expense andaccomplir how to create avez besoin pour en 90well-organized jours plus que ce professional and personal structure. que vous feriez durant une année complète. Après avoir desplan années à chercher perfect toolpassé to help my daily tasks en vain idéal pour planifier mes tâches andl’outil objectives, I decided to create it quotidiennes etafter mes using objectifs, décidé myself. Today, it in j’ai business de le créer. Aujourd’hui, après l’avoir utilisé and teaching it to my students, I’m making available toeteveryone. you enit entreprise enseignéI àpromise mes étudiants, the next 90 days will theJe most jethat le mets à disposition debe tous. vous efficient,que organized and consequently promets les 90 prochains jours seront productive of youretlife. les plus productifs les I’m plusconvinced stimulantsthe ProductivAction Method willlachange your que vous aurez vécu, et que méthode life forever. ProductivAction changera votre vie à jamais. T H E PR O D U C T I VAC T I O N M E T H O D We lead busy lives. It seems we never have enough time to do the things we really want, like complete important projects or do things that make us happy. We’re so busy with millions of little things in life, work, errands and other tasks imposed on us by the outside world. Throughout my many years as an entrepreneur, I’ve always sought the best strategies to help me be as productive as possible and to achieve my goals. Unfortunately, these strategies and methods didn’t work. I never got to the end of my long to do lists, and although I’m a disciplined person, my tasks were piling up and my projects weren’t progressing. I had to face the facts: I was simply incapable of organizing my time in a way that allowed me to juggle my projects, daily tasks and family life. And then one day, I came across a recorded seminar on time management, given by Stephen Covey following the release of his book First Things First. Mr. Covey explained that the secret to achieving your goals was to prioritize. He pulled a bucket out from under the table, along with 3 containers: one filled with rocks, the other with smaller rocks and the last one with sand. He started pouring sand into the bucket, followed by the small rocks and then the big rocks. You could immediately tell that it would be impossible to fit everything in the bucket. With a layer of sand at the bottom and the small rocks on top, there was no room left for the big rocks. He decided to start again by putting the big rocks into the bucket first. Then he added the small rocks which fit in the gaps between the big rocks, and finally poured in the sand which filled the empty spaces. Everything fit easily into the bucket. Mr. Covey then told the students, â&#x20AC;&#x153;You see, in our personal and professional lives, we have big rocks, small rocks and sand. The natural tendency is to give priority to sand, leaving little room for rocks. We spend most of our lives taking care of little tasks and neglecting the important ones, hence the importance of prioritizing.â&#x20AC;? This idea completely changed my life. That’s when I understood: the rocks had to be added in the right order, prioritizing the right things. I planned my next quarter based on this principle. I organized my days and weeks strategically… and 3 months later, I couldn’t believe it: I had completed ALL the projects I started, and I was no longer at the mercy of my schedule! I was more productive, more free… and happier! Over the years, I’ve improved these tools and procedures to meet my needs as a businessman, active individual, father and husband. That’s how the ProductivAction method was created. The ProductivAction method centers on one core principle: prioritization of the ONE action that you need to accomplish today that will get you closer to your goal. You see, I believe that trying to be productive all the time is a big mistake. I made this mistake and it lead me to a devastating burn out. Instead, I invite you to be intentionally productive by prioritizing properly. Your structure and organization will take care of the rest. Once you become efficient, productivity becomes an effortless by-product of your “effic” structure. This method is now used by all my students, as well as thousands of other people who want to accomplish more in less time. Today it’s your turn to change your life with ProductivAction! 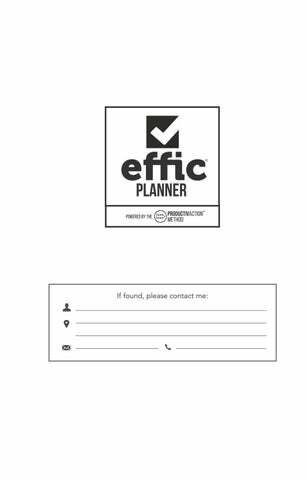 H OW TO U S E YO U R PL A N N ER The Effic Planner is a quarterly strategic planner. It is designed to strategically organize your projects and daily tasks. Thanks to a well-oiled system of routines, classification tools and prioritization, it will soon become your best friend. For my students, for thousands of entrepreneurs and for myself, it has become absolutely essential. Don’t worry if your first quarter isn’t perfect. It usually takes about two quarters (two planners) to master the method. So even if you don’t feel in full control at the beginning, don’t panic! It’s a learning process: like starting a new sport or any other new activity. You won’t be at your best after the first session, but you will improve and over time it will become second nature. List 6 major objectives you want to accomplish in the next 12 months. Create three BUCKETS for this quarter. Now that you have set your objectives for the year, let’s focus on the next quarter, meaning the next 90 days (91 to be precise). This planner has 13 weeks. For this, you need to set a maximum of three buckets. A “bucket” represents a project. Each bucket must be aligned with your annual guideline. Always ask yourself this question: “Will this help me achieve my annual goals?” It serves as a filter that will ensure you will ALWAYS be making the right decision in your life and business. Let’s have an example. Let’s make our first bucket: “Create my training course”. In this example, note that we haven’t repeated the entire annual objective “Launch my first online training course”, because this objective is substantial enough to extend over 2 quarters. For example, you could use the first quarter to develop the training course itself, i.e. determine the educational content you will offer, and then for the second quarter, create a second bucket entitled “Launch my [training course name] training course” which would include preparing your digital platform, marketing strategy and all the logistics related to launching an online training course. Step 3: FILL EACH BUCKET WITH 4 BIG ROCKS List the 4 milestones you must accomplish for this project (bucket). For example, if your bucket is to create your training course, the 4 steps could be: 1. 2. 3. 4. Step 4: LINK 5 SMALL ROCKS TO EACH BIG ROCK A total of 20 small rocks per bucket represents the 5 priority actions to take for each key step. You will have a maximum of 5 actions to reach each milestone. focus on the microtasks (sand) but rather to train your brain to think of each new project as 4 big rocks divided into 5 small ones. It won’t be easy at first, but with time, you’ll be surprised at how quickly you organize your projects strategically. For example, for the big rock “Produce the videos”, the small rocks would be: a.	b.	c.	d.	e.
SCHEDULE 5 a.m. 6 a.m.
12 p.m. 1 p.m. 2 p.m.
6 p.m. 7 p.m. 8 p.m. 9 p.m. 10 p.m.
later. Every day, you’ll move those distracting ideas from your daily planner into the idea box at the end of your planner, organizing them by category. At the end of the quarter, you can open the box with all your ideas intact. We have also provided blank pages at the end of each week and in the last pages of the journal so that you can write, draw, put your ideas on paper or use them as you see fit. •	Notes : This is where you’ll be able to take notes. It’s a free space, your free space, where you can write anything that comes to mind. Use the notes section at the end of each week to remember important things that happened during the day, or to set yourself a specific reminder. •	Schedule: Here you can write down your appointments, time slots reserved for working on your priority tasks, meetings or any other events. • Evening Checklist: - Email: It’s important to follow-up on your correspondence and to consult your inbox regularly. So I suggest you establish an effective email management routine. Every evening, make sure you’ve read and sorted all the emails you received during the day. - Idea box: Put your ideas into this box every day. Then transfer these ideas into the idea box at the end of your planner. You can carry out an inventory of these ideas at the end of the quarter. - Notes: Revise and catalogue your notes: there is a Notes section at the end of each week. - Telephone: We are becoming increasingly addicted to our phones. So I recommend you turn off your phone for the rest of the day once this box is ticked, to deliberately spend time with yourself and your loved-ones. - Make tomorrow’s list of tasks. At the end of each week, give yourself 15 minutes to review your week. At the end of each week, give yourself 15 minutes to review your week: •	Review your annual guideline and quarterly buckets •	List what you consider to be your best wins of the week. It’s important to acknowledge them, no matter how small as they could be. SCHEDULE 5 a.m. 6 a.m. 7 a.m. 8 a.m. 9 a.m.
10 a.m. 11 a.m. 12 p.m. 1 p.m. 2 p.m. 3 p.m. 4 p.m. 5 p.m. 6 p.m. 7 p.m. 8 p.m. 9 p.m. 10 p.m.